New York, April 15 (IANS) Appalled by the widespread ignorance of Sikhism that sparks hate crimes, a Sikh organisation has launched a $1.5 million TV campaign to educate Americans about the faith and how the religion’s values of tolerance and equality reflect that of the nation, according to its promoters. 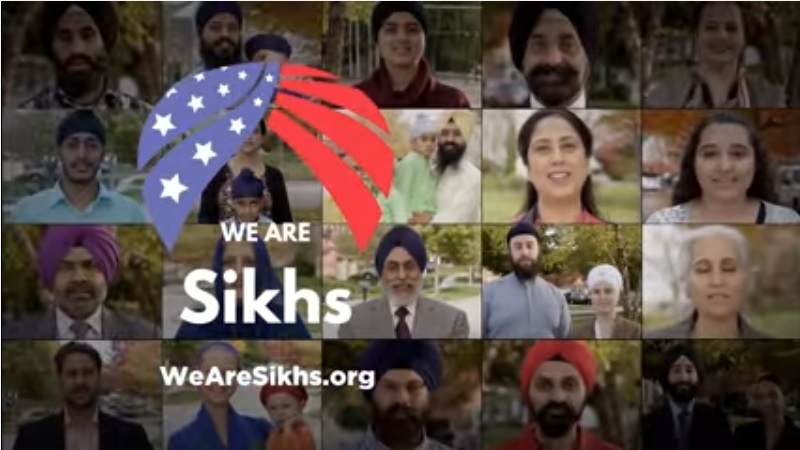 The TV commercials from the National Sikh Campaign (NSC) that debuted on Friday on Baisakhi, are backed by research into Americans’ perceptions of Sikhism and religion and take on an original approach with a positive spin presenting Sikhs as integral members of the US society, whether it is politics or popular culture. “We needed to go beyond the narrative about hate crime and discrimination,” Rajwant Singh, a co-founder of the NSC told IANS. While Sikh leaders have been meeting Presidents and top elected leaders and were warmly received, Singh said, it was realised that it was important to reach out to the common American because the ignorance at that level drives hate crimes against Sikhs. The ads running on national news channels CNN and Fox News, and on local stations in Fresno, the California city with the highest number of Sikhs, shows the community as American neighbours going about their daily lives, professing patriotism and national values – but also a shared love for the TV series, “Game of Thrones” and the children’s show, “Sponge Bob Square Pants”. The campaign draws on a broad base of support. Singh said that it “was really an amazing, heartwarming experience” to have non-Sikhs, Indians of various communities and Hindus backing it. One of the largest donors to the effort is a Hindu community in Las Vegas that raised a substantial contribution, he added. Two political strategy and messaging companies, one specializing in Democratic Party candidates and the other in Republican and conservative causes were involved in the production of the ads – so far three 30-second spots have been created – and their marketing. Singh, who is a dentist in a Washington suburb in Maryland, said that their studies showed that 60 per cent of Americans had not even heard of Sikhism and, therefore, the first task is to make the masses aware of the religion. When the clothing chain Gap featured Sikh actor Waris Alhuwalia in their ad, Singh said that 100 customers at the company store were surveyed and about 85 thought he was a Muslim, four that he was a Hindu and four said he was a Coptic Christian. “Can you imagine?” he asked with a rueful laugh. Sikhs have been targeted for hate crimes due to popular ignorance of the religion and its adherents being mistaken for Muslims or Arabs because of their turbans even during Barack Obama’s presidency. Three days after the September 2001 attacks, Balbir Singh Sodhi was killed in Arizona in a hate attack and in 2012 six Sikhs were shot dead and four injured in an attack on a gurdwara in Wisconsin. In the latest attack, a Sikh was shot in the arm in Washington state last month. The NSC plans for a national campaign began long before the election of President Donald Trump. “Our process started way back in 2014,” and it was “really prompted by the attack on the Gurdwara”, Singh said. That was when they found that all their efforts of more than a decade since 9/11 “had not moved the needle,” Singh said, and it called for a fresh approach. They turned to highly regarded professionals. Hart Research Associates, which had worked in Hillary Clinton’s campaign, conducted studies and ran focus groups in New Jersey and Chicago to understand how the average American thinks about a man with a turban, Singh said. After the groups were told about the Sikh religious values and its commitment to tolerance, equality and service to others, their perceptions changed, he said. Based on that study and what they found about what the participants liked about Sikhs, the ad were prepared by AKPD Message and Media, which had worked in Obama’s campaigns. The ads were tested with about 700 Americans to make sure they would be well received, Singh said. In the final step making it a bipartisan endeavor, Singh said that for marketing the ads they hired FP1 Strategies, which is a more conservative and Republican-leaning strategies and marketing company that had worked in former President George W. Bush’s campaigns.